Later this week we will run a detailed report on what Mattel showed for Barbie at the 2019 International Toy Fair in New York, which just concluded yesterday, but today we’re going to take a look at what we can expect from the other fashion doll lines on the market. Right off the bat, because there has been so much interest in Monster High here in PopCult since I covered the demise of the toy line last year, I have to tell you that there is no real news to cover. However, there are some encouraging signs. 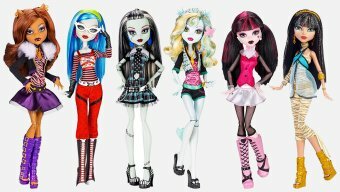 The Monster High YouTube channel continues to be updated with fresh content every week or so. The property has been mentioned as possibly being among the 22 television pilots in development from Mattel’s new TV production unit, and the official website is still up and running. That’s the good news. Also, the Monster High girls have not been painted out of the huge Mattel mural on display in their press-friendly showroom. The bad news is that there have been no new toys offered to retailers since late 2017. 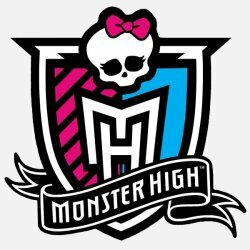 The Monster High Facebook page has not been updated in nearly a year. Except for coloring books and the long-delayed crossover novel with Ever After High, there have been no new books since 2016. Garrett Sander, the person who created the line for Mattel, left the company last summer to move to Australia and work for Moose Toys, the folks who make Shopkins. 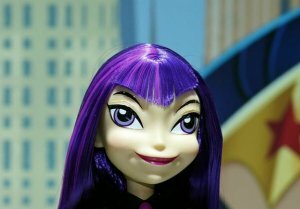 No Monster High toys of any kind were shown at Toy Fair last week. Word came from France last year that they were getting new dolls from the line, but when they were revealed, it turned out to be leftover product that had already been sold in the US and UK two years ago. It’s a sure bet that, if Mattel’s possible Monster High pilot gets picked up by a network or streaming service, some new toys will be produced to exploit that new exposure. Until then, there is nothing new to report. It is entirely within the realm of possiblity that Monster High will return to the toy aisles, but probably not this year. 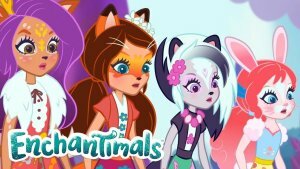 Likewise, Mattel’s Ever After High and Enchantimals(seen right) are in the same situation, with fresh content on their respective YouTube channels, but no new retail product on the horizon. Enchantimals may have set a land-speed record for having its production halted after less than a year on toy store shelves. Two presumed dead Mattel fashion doll lines did return, somewhat, at Toy Fair this year. Both DC Superhero Girls and WWE’s fashion dolls were shown, although the WWE line didn’t seem to have any new dolls in the line, just figures that saw limited release last year (along with a new plush line, coming in the fall). It’s possible that the Amazon-exclusive dolls of Asuka, Lana and Bayley will turn up at Target or Walmart now, but the Toys R Us liquidation saw a huge glut of the first series of dolls, and those can still be found cheap at deep-discount stores. DC Superhero Girls, which went from being a billion-dollar brand to being virtually abandoned by Mattel, is returning now that it will be featured in a new series on Cartoon Network. Unfortunately, the dolls have been drastically redesigned, with even bigger heads, and weird face sculpts, and they’ve lost some of their most marketable characters. While still featuring Wonder Woman, Batgirl and Supergirl as their key heroines, it seems that the new cartoon series has jettisoned the villains, who admittedly were a bit of a logical sticking point, so we will no longer have Harley Quinn or Poison Ivy in the mix, which takes out two of the top-selling characters. It’s possible that somebody realized that mixing the lead from an R-rated movie into a cartoon for little girls might not make the best business sense. Or maybe it’s just that both characters are criminally insane murderers in the comics that made the powers that be think twice. Either way, the line will have an uphill battle with this latest “refresh” of the concept. The original series sold very well with its initial realease at Target, but ran into problems when Mattel over-produced the same dolls and shipped them to other retailers, who wound up dumping them in their clearance sections. The line didn’t need this drastic of a new look, and probably would have benefitted from a less cartoony approach, making them more like fashion dolls with realistic proportions. 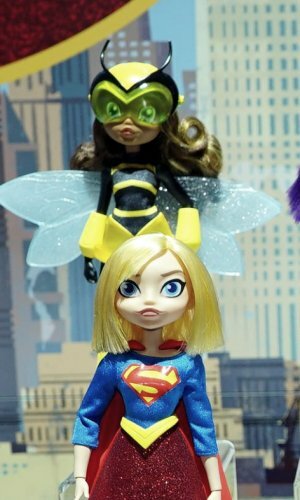 The way DC Superhero Girls look now, these weird new bug-eyed giant-headed dolls (see the close up right) that look like Bratz rejects might find it difficult to connect with young girls. Our friends at Lammily did not display at Toy Fair this year. Supplies of the original Lammily dolls are running low, but they do continue to make new outfits and accessories. Currently they are redesigning the body for Lammily, and are asking collectors if they would prefer more articulation. We may see big things next year. This year they’re smarting a bit from watching Mattel get tons of press for releasing a wheelchair for Barbie, like Lammily did two years ago. Hasbro, thanks to their deal with Disney (and Star Wars and Marvel) is a player in fashion dolls now, and showed off an array of new dolls based on Captain Marvel (in stores now), plus the Disney Princesses in slumber party mode, as seen in Ralph Breaks The Internet. 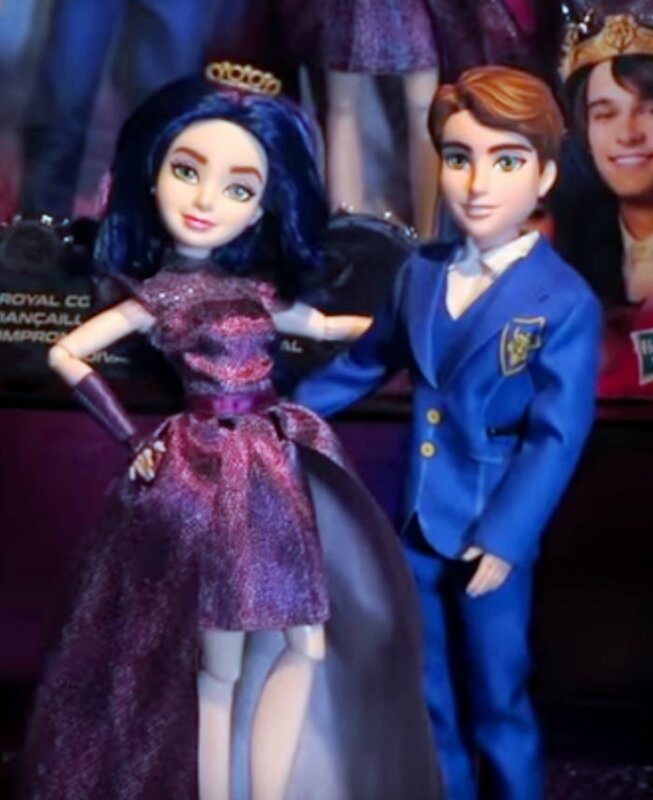 Hasbro also unleashed a slew of new dolls based on the upcoming Descendants 3 movie. Late last year Robert Tonner shut down the Tonner Doll Company, and started over with the high-end Phyn & Aero company, which will continue some Tonner doll series, but not the licensed properties like DC Comics and Harry Potter. Phyn & Aero seems intent on chasing the high-ticket market, with dolls that sell for the $120 -$300 range. MGA Entertainment, who had an amazing year with their award-winning L.O.L. Surprise line of blind box mini-dolls, seemed focused on that toy, which is one of the best-selling in the world, and doesn’t appear to have shown any new Bratz or Project Mc2 product this year. There is a new Bratz designer collection, with the first assortment featuring the work of Hayden Williams, but it is exclusive to Amazon and therefore was not on display at Toy Fair. That’s a quick look at the non-Barbie fashion dolls. Check PopCult in a day or so for a look at what Mattel has planned for Barbie’s 60th year. the first set of DC girls were wonderful dolls. It is a shame they went so far away. The Enchantimals lasted way longer than Mattel’s real failure in the doll market; 2001’s Flavas. Speaking about fresh content on MH’s YouTube channel: To be fair, it’s just recycled “compilation” content – webisodes that are cut together to make a longer video. Many defunct doll line channels, like the Bratz one, have these videos and I wonder why. Interesting to learn that. My guess is that it’s a cheap and easy way to protect the trademarks.